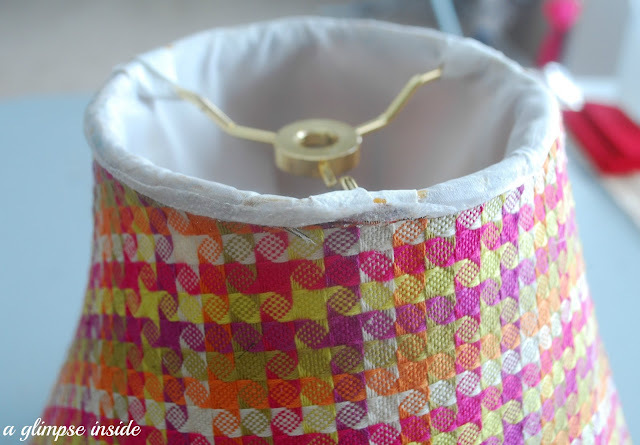 I've recently had the opportunity to review some fabric from the new HGTV Home line from JoAnn craft stores. 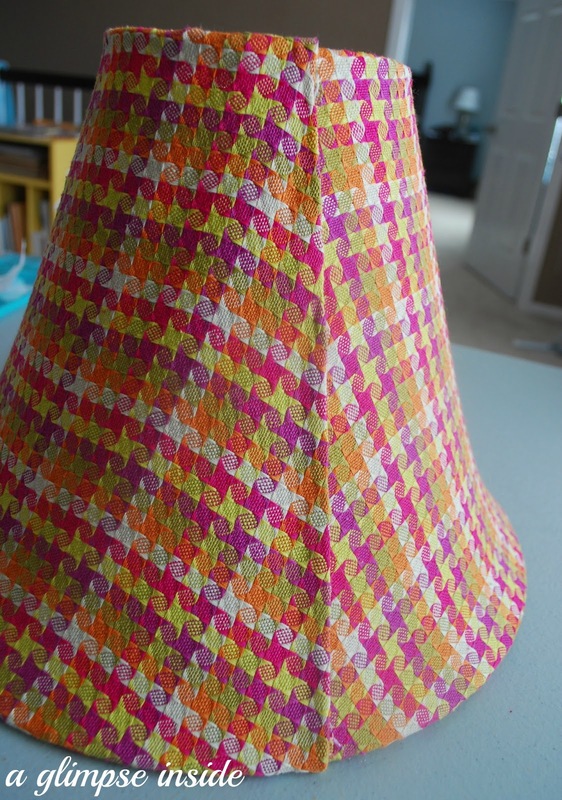 I received two coordinating fabrics, 1 yd each, and then some coordinating trim. 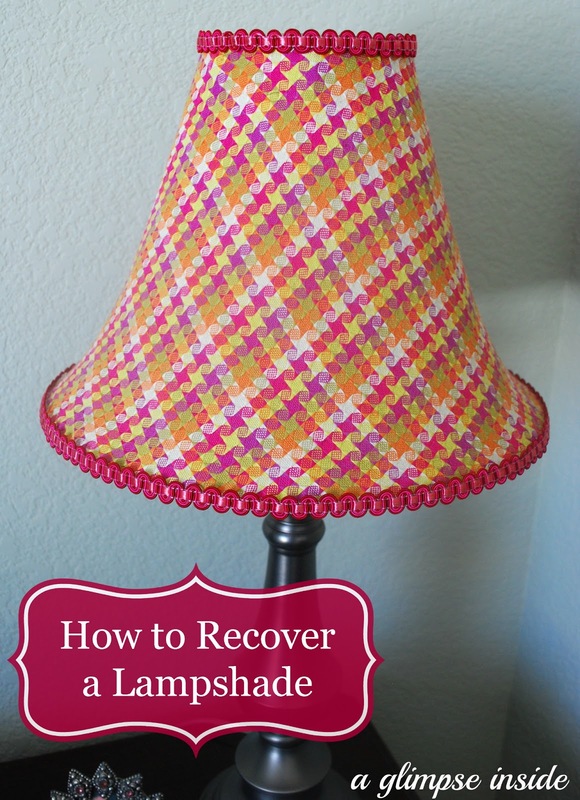 I decided to recover a lampshade that was in my guest room with one of the fabrics and the trim. I was a little nervous to try it out but it was so easy! This was my old shade- gold and red paisley and TOTALLY didn't match the decor in my guest room. 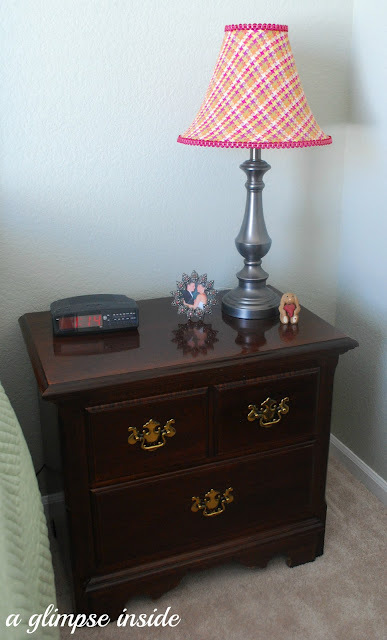 I used to have it in our room at one point and eventually just ended up in the guest room because I needed a lamp. 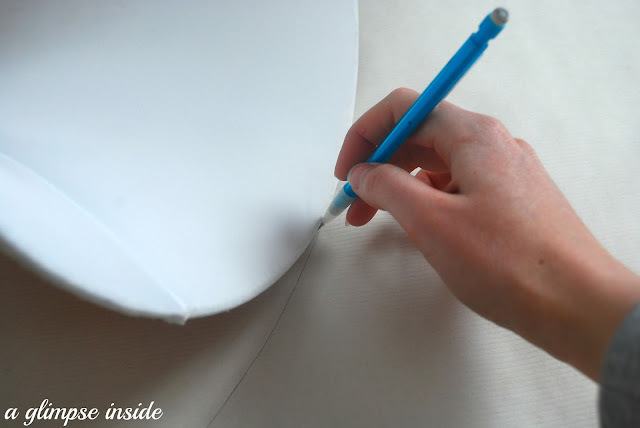 First, trace your lampshade on craft paper. Trace the top and bottom rim of the shade. 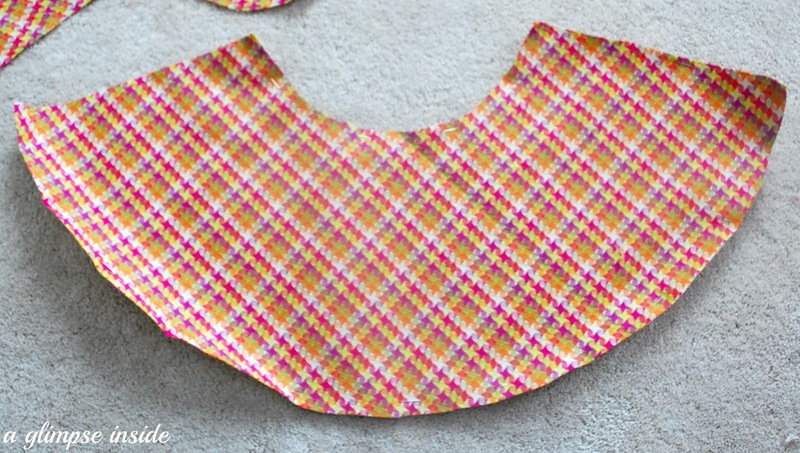 Once I traced the shade, I added a half inch to the top and bottom lines for seam allowance. I also made new lines about a 1/4 to 1/2 inch above and below the original traced lines of the shade to allow for me to fold over the edge on the shade frame. In this pic, you can see the lines where I actually traced the shade and then where I actually cut out. 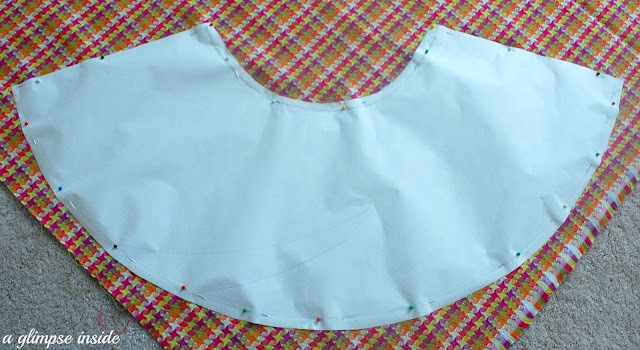 Iron your fabric and then pin the template to your fabric. Cut out your fabric and you are ready to begin tearing apart the old shade. 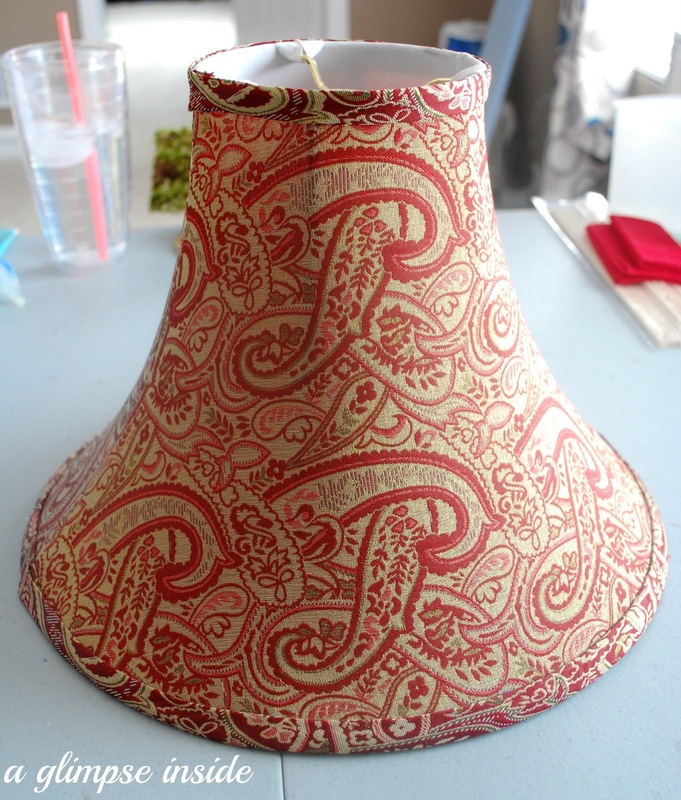 Once it is time to start working on the shade, first rip off the trim from the top and bottom of the lamp. It was just glued on so it was super easy to pull off. 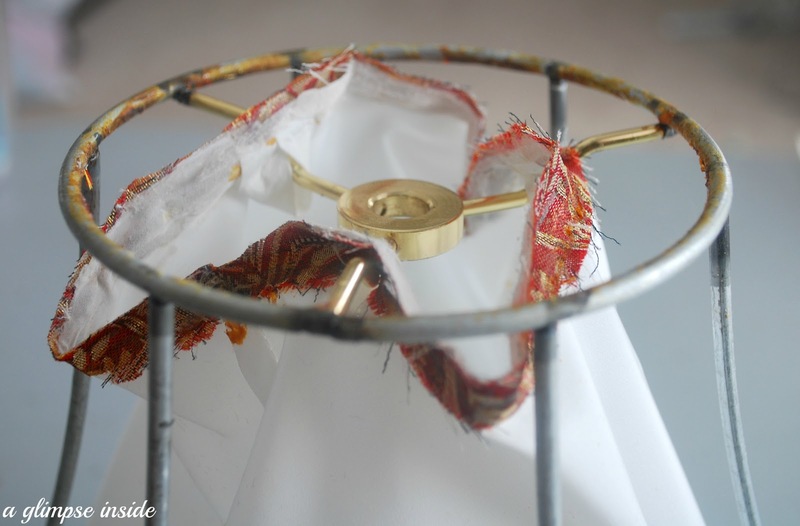 I then carefully sliced the outside fabric, (do not cut the liner! 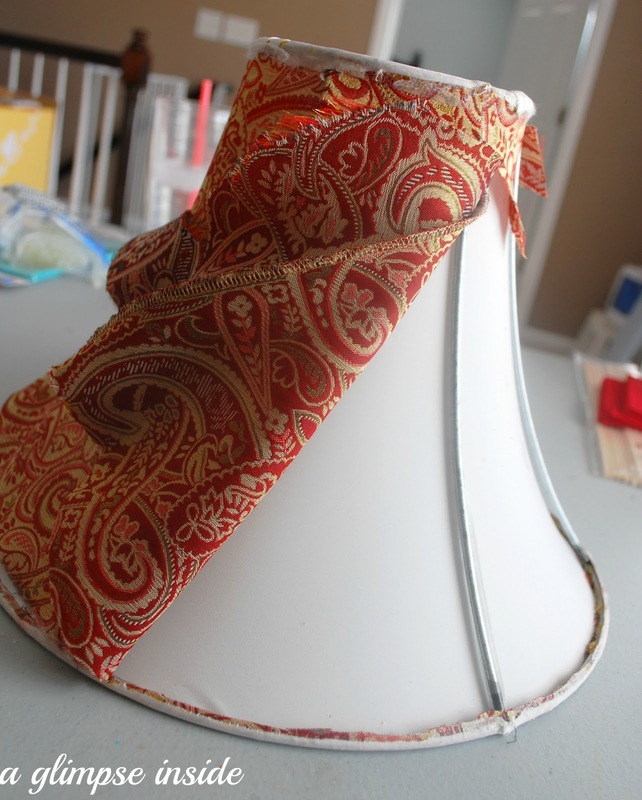 ), and cut off the fabric along the top and bottom rims of the shade. My entire shade was originally just glued together so I also just glued my new shade together. Peel off the liner from the TOP of the metal frame only. I just pushed it out of the way toward the center so it didn't get caught in the glue. 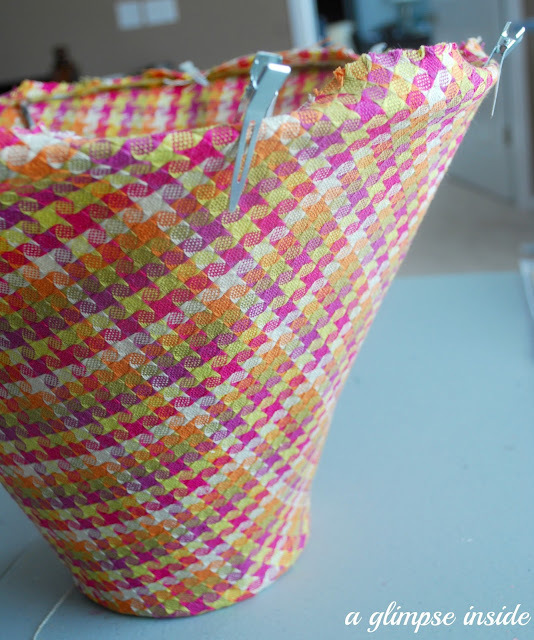 Pull out your HIGH temp glue gun and get to gluing the new fabric on. High temp gun is key, otherwise your glue will dry as soon as it touches the metal if you use a low temp gun. Continuing gluing all the way around. 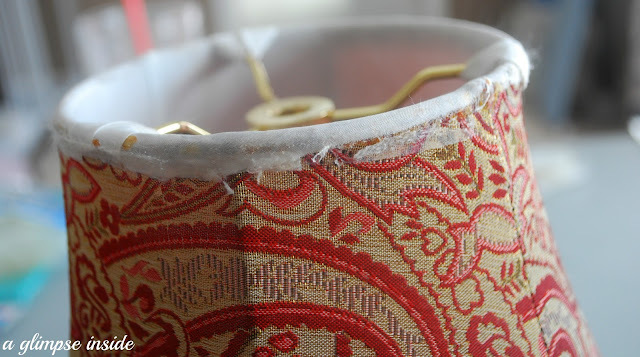 Once the fabric is glued to the top rim, peel off the liner from the bottom rim. I just let it fall in the center of the shade. I then pulled the fabric over the bottom rim and used alligator clips to keep it in place. I clipped it all the way around and made sure the fabric was tight. 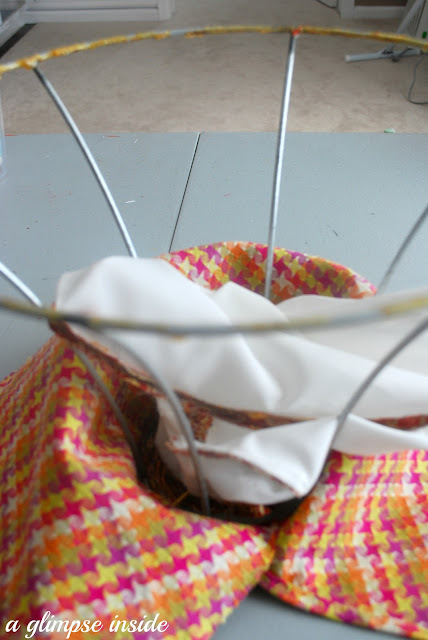 Glue fabric over the rim pulling tight to ensure there are no creases in the fabric. 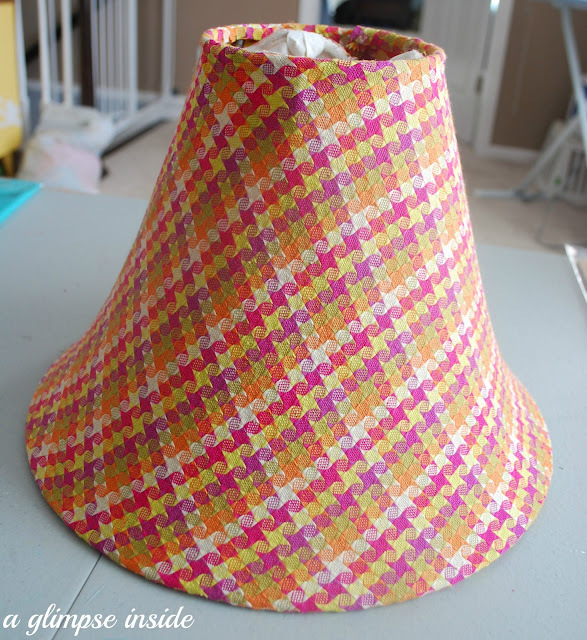 Here is the shade all covered in the new fabric. 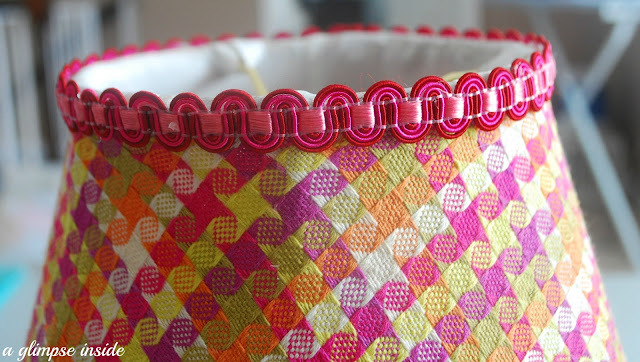 I glued the seam down last after the fabric was glued around the rim on the top and bottom. Time to replace the liner. I trimmed off any of the old fabric still attached or showing on the liner. 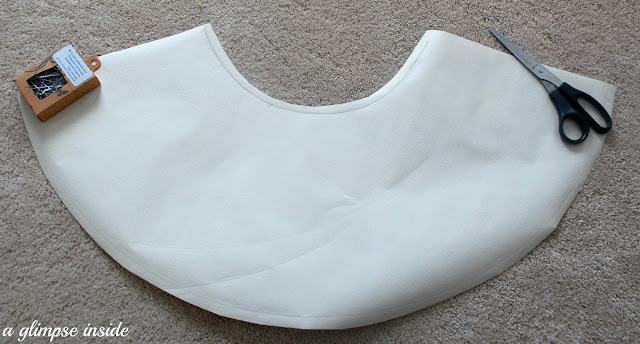 I then glued the liner back onto the rim covering any raw edges of the fabric. Again, start gluing the liner on the top rim and then glue it along the bottom rim. I glued the coordinating trim along the line where the liner came over the edge of the rim on the top and bottom and I was done! I am super happy with how it came out and was so much easier than I thought it would be! The new shade definitely fits in with the guest room decor MUCH better! The HGTV Home line of fabric and trim is 50% off at JoAnn from April 14th- May 4th! Also, I have a 10% off coupon for the HGTV line that you can use on top of the sale! Woo! 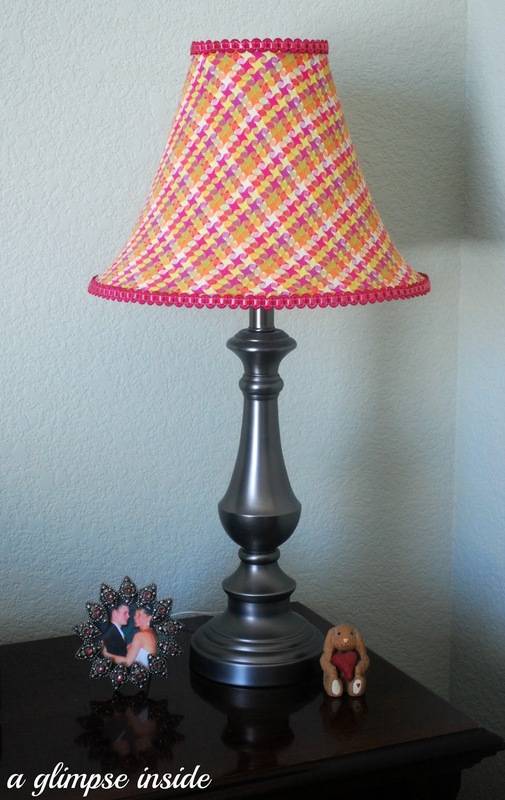 Wow, your lampshade is gorgeous! Very well done and I LOVE your tutorial! Your lampshade is super cute. Thanks for sharing it!